Furla is a leading leather company founded in 1927 by Aldo Furlanetto in Bologna, specializing in fashion leather goods, with a special focus on ladies handbags: a long tradition of craftsmanship, experience, sense of beauty and commitment to innovation for over 90 years. 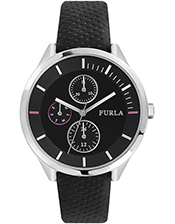 Since 2016, Furla watches are produced under license by Morellato-Sector Group, and distributed in 79 Countries and over 4,000 points of sale in Europe, United States, Middle East and China. Furla watches are the embodiment of exclusive and high quality details, the original creative approach to unusual shapes, bright emotions and modern italian lifestyle. The collections of Furla watches have the same name as the collections of Furla accessories, which expose DNA collections in various elements and colors, allowing to create a complete "total look". Particularly noteworthy is the collection of Furla Metropolis, Giada: the strap of this watch can be easily changed thanks to a simple mechanism. 13 and 16 mm straps are available. In the Furla Pin lines, there are 3 removable amulets which can be easily reorganised, allowing to change the appearance of the accessory. Exclusive gift case allows to store the accessory without losing the amulets. 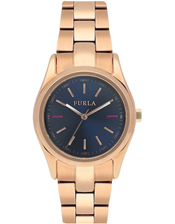 Furla watches: special offer at 75% off SRP! Are You Gonne Be Fast Enough? You are receiving this message because you are registered on our site. We do not communicate your details to third parties, respecting your privacy. For more information see our website. This email is automatically sent: eventual replies to this message will not be read or responded to.